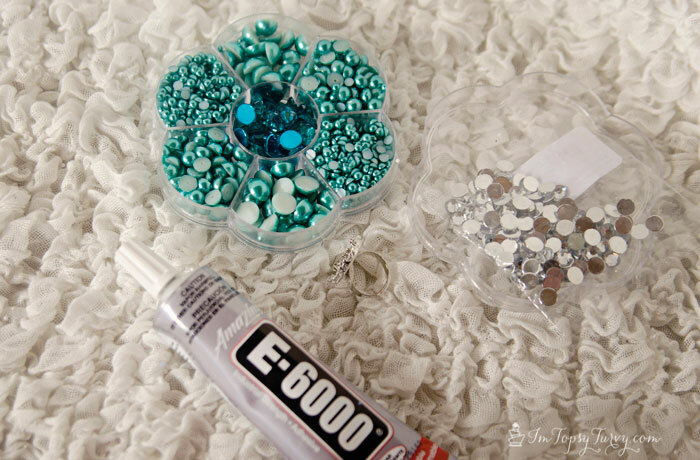 This was the craft I was most excited about for the party! 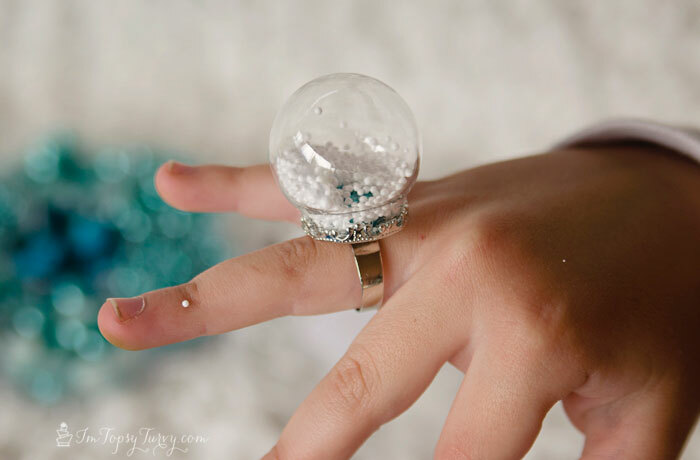 Create your own snow globe rings! These are great because you can put ANYTHING in them! I bought extra so the kids and I can play around and have fun! First you want to start with the ring! I got mine from this cute Etsy Shop – Ingredients for Lovely. I bought the ring base and glass globe sets sized 20mm ring base, 30mm diameter of globe. 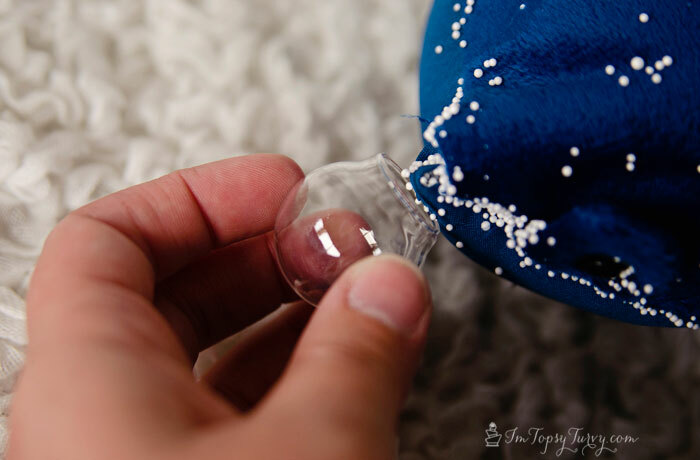 Make sure the glass globes will still fit around whatever you put in the center. SERIOUSLY, check before it dries! Once your sure it fits let the center dry completely. Princess loved these rings as much as I did! She experimented with all the different fillers, her favorite was the iridescent flakes, but she added a TON, you can’t even see the rhinestone “ice mountain” anymore! My favorite? 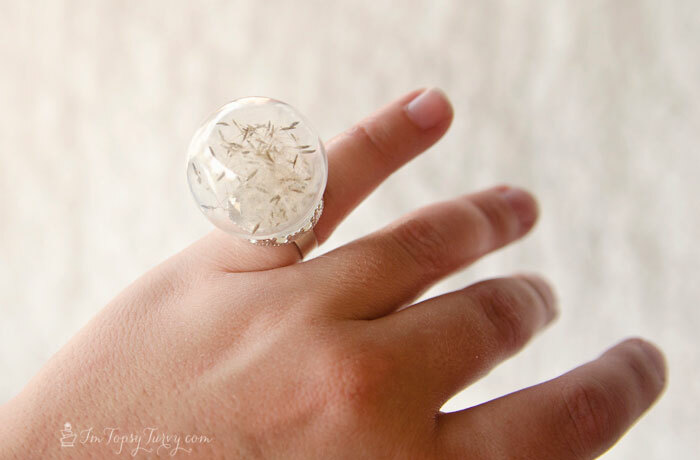 I grabbed a dandelion from the backyard and shoved about half the fuzz into a ring! Seriously love it! 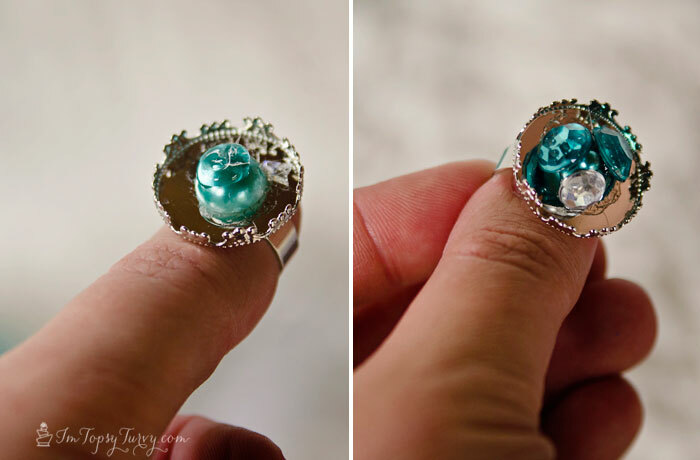 Going to enlarge my ring base so I can wear it as a statement piece! 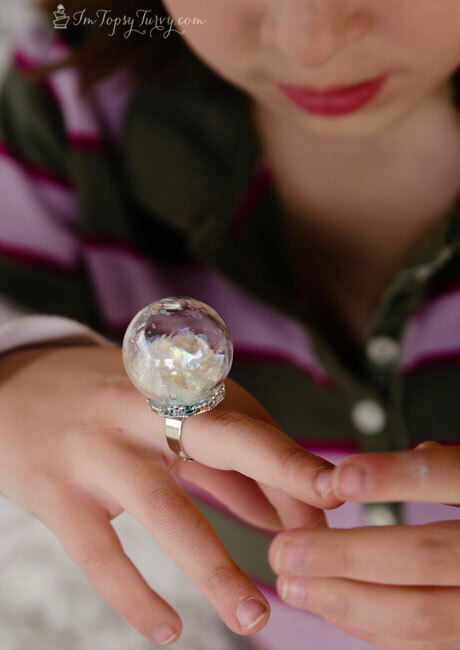 What would you put into a snow globe ring? I think I’m going to try succulents next? Just need to figure out a way to be able to add moisture to it when it needs it. I LOVE this idea. 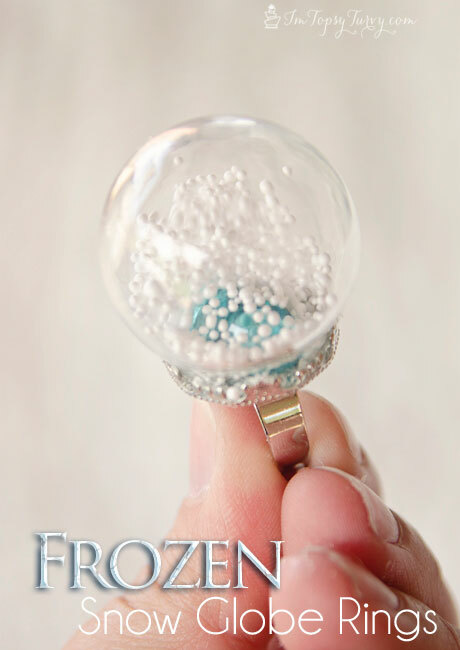 Cannot wait to do this for my daughter’s Frozen birthday party. Where did you get the rhinestones, I love them! I got them from Amazon here! Where do you get the globes that tiny? are they glass or plastic? 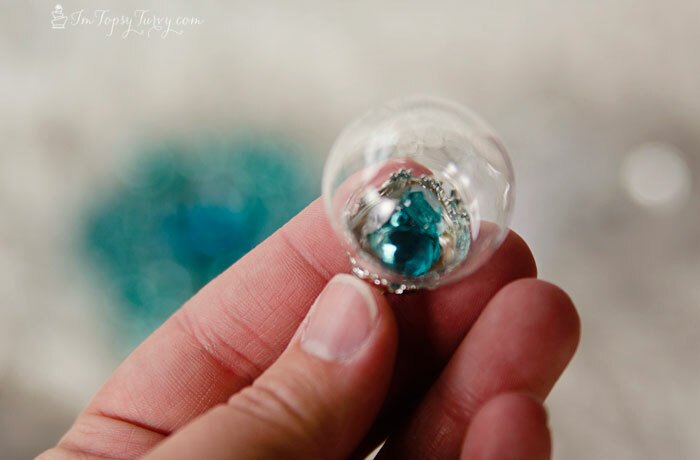 I want to make them for my 5 year olds party but glass?? they are glass. My 7 yo has had her’s over a year and hasn’t had a problem, 5 might be a little young. She doesn’t wear it every day of course, just once in a while. thank you so much! probably my favorite birthday party craft ever! my daughter still wears her’s, it’s been 7 months or so, and it’s still intact! I think they are cute and unusual, but if they are glass they would break very easy. Why because I have a wedding ring that sets high and it hits everything. My daughter doesn’t wear it every day like I do my wedding ring, just for fun sometimes. It’s been almost a year and it’s never broken. It’s been dropped and bumpked and it’s still fine. That said of course it will probably break at some point, just like the glasses or plates in the kitchen I let my kids use, and if and when it does I’ll just clean it up! can you fill it with water without it leaking?